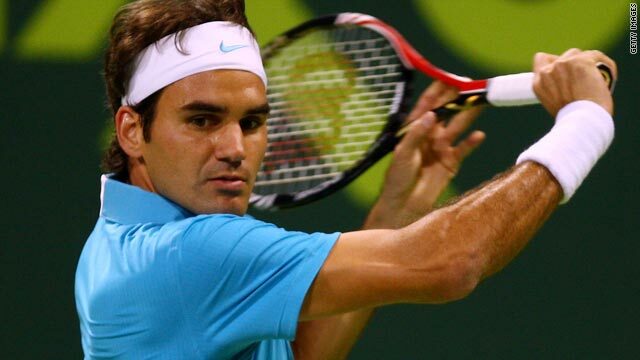 Roger Federer bounced back from his pre-season defeat by Robin Soderling to win his opening match in Doha. (CNN) -- Roger Federer and Rafael Nadal made light work of their opening matches on the 2010 ATP Tour circuit on Tuesday, but a man who has beaten the world's top two tennis players suffered an embarrassing defeat. No. 1 Federer brushed aside unseeded Belgian Christophe Rochus 6-1 6-2 in the first round of the Qatar Open in Doha, while second seed Nadal was similarly untroubled in defeating Italy's Simone Bolelli 6-3 6-3. However, world No. 8 Robin Soderling was knocked out in the first round of the Chennai Open in India, where he was top seed. The Swede -- who beat Federer in an exhibition tournament in Abu Dhabi last week before losing in the final to Nadal, on whom he inflicted a shock defeat at last year's French Open -- was beaten in straight sets by American Robby Ginepri. "Everything went wrong for me," Soderling said after his 6-4 7-5 reverse to a player ranked 100th in the world. "I wasn't hitting the ball well, I didn't take my chances and he took his. "It doesn't matter whether you have two break-points or three, you still have to take them." Swiss star Federer should have another easy ride in the second round when he faces unseeded Russian Evgeny Korolev, while Spaniard Nadal takes on another Italian in Potito Starace. The day's most significant result in Doha saw 38-year-old Moroccan wildcard Younes El Aynaoui become the oldest player to win an ATP Tour match since Jimmy Connors, who was 42 when he triumphed at the Halle Open in 1995. El Aynaoui, whose previous competitive match was in May 2008, beat American qualifier Ryler DeHeart 7-6 (7-3) 7-6 (7-4). The 2002 champion, who was runner-up in 1996, earned a clash with Belgian qualifier Steve Darcis, who upset Spanish eighth seed Guillermo Garcia-Lopez 6-4 6-1. Meanwhile, at the Hopman Cup mixed teams event in Perth, hosts Australia eliminated the United States with a 2-1 victory in Group A on Tuesday. Samantha Stosur beat Melanie Oudin 6-2 6-4, then Lleyton Hewitt gave Australia an unassailable lead by defeating big-serving John Isner before the Americans won the mixed doubles. Australia, who have a win and a loss, next face Spain -- who remained on course for a fifth final appearance with a 3-0 drubbing of Romania. Maria Jose Martinez Sanchez won the opening singles 6-4 6-3 against Sorana Cirstea, and then the Romanians had to concede after Victor Hanescu suffered an injury and pulled out at 6-3 down against Tommy Robredo.